Painting is a wonderful activity for preschool children. 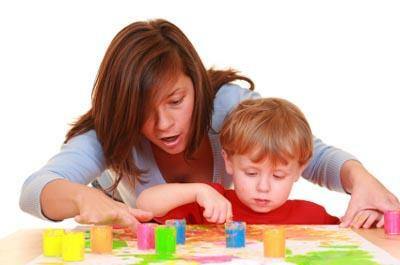 Preschool painting is a fun activity that lets children express their creativity. It's also a guaranteed way to keep kids entertained and away from the television. Although it's possible to purchase fingerpaint at any craft store, making your own paints is a fun activity for anyone interested in preschool painting. In many cases, homemade fingerpaint is even edible! Combine pudding mix with milk. Add food coloring to make desired paint colors. Paint designs on paper plates or wax paper. Place whipped cream in mixing bowl and beat with electric mixer. Add food coloring to create desired color. Create designs with your edible homemade paints! Mix oil and water into dry ingredients. Enjoy colorful and sweet smelling paint! Pour 1 tablespoon corn syrup onto paper plate. Add two or three drops of liquid food coloring. Mix and paint with fingers. Place the cornstarch in a large saucepan. Gradually add cold water, stirring until lumps disappear. Add boiling water while continuing to stir. Cook over medium heat until clear. Stir constantly. After paint mixture thickens, add soap flakes and talcum powder. Beat until the mixture is thick and smooth. Add food coloring to make desired colors. Refrigerate homemade paint in a plastic container. Fingerpainting is a favorite preschool pastime, but sometimes this activity is simply too messy to be practical. When you need a mess-free way to keep your child busy, consider investing in a set of Crayola Color Wonder Fingerpaints. Color Wonder products are made from a unique ink that only appears on a special type of paper. This means that you won't need to worry about stains on clothing or furniture. Sold in art kits with either a color book or plain paper pad, the paints are also spillproof for even greater convenience. You can learn more about Crayola Color Wonder Fingerpaints by visiting the Crayola website. Creating texture: Fingerpaint a solid surface, then use combs, cotton swabs, or stiff paint brushes to create textured designs within the paint. Etching: After painting a solid surface, use your fingernails or a toothpick to scratch away a design. Symmetry: Paint a design on one side of the paper and fold it in half. Press down firmly before unfolding to reveal a perfectly symmetrical design. Dot paintings: Use just your fingertips to create a painting made from a series of small dots. Place dots of different colors next to each other to see what happens. Waves and wiggles: Try using different parts of your body to create waves and wiggles on the paper.